The Bishop’s Cathedral – worth throwing the camera bag in the car! I have to admit that I don’t always have a camera with me, assuming of course I exclude my iPhone from that statement. Just occasionally as I get ready for another days work, I will throw (not literally) a camera bag into my car, believing that I may find a little time to take a few photographs on my way home and before the dinner is burnt! Sometimes this is because I specifically want to try something out which has come into my mind. I guess these thought processes inspire me to make that little extra effort to take some shots. This sequence of events happened earlier this week. I wanted to use my 28mm f.2.8 lens as it isn’t attached to the camera that often. My default choice of lens is the 50mm f1.4 Summilux. It was a lovely bright evening with some light cloud cover. Bright enough for some shadows but not so bright to give me exposure problems. 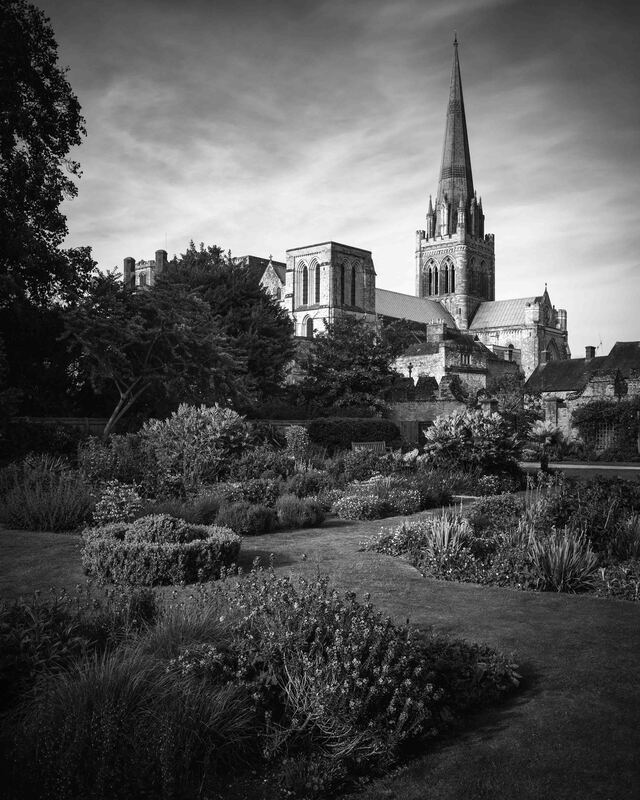 I headed for the city of Chichester and specifically Bishop’s Palace Gardens, which offers fine views of the Cathedral. I found a position which I thought would give me a good composition. Held in the vertical position the viewfinder of the Leica Monochrom is not that easy to use. I wear glasses and the frame lines for the 28mm are in the extreme corners, so I have to move my eye or the camera around to compose the shot. I have to say there is a little guesswork involved and I try and allow a margin for error so I can crop later if I wish to. A quick look at the screen on the back of the camera tells me whether or not I need to have another go! The other slight issue that evening was the sky. It looked a little bland but I could see some blue patches so I attached an orange filter to darken these areas and add interest to the sky. Yes an orange filter on a digital camera – something that only works with the Monochrom. Its sensor only records luminance and not colour, so a colour filter works in exactly the same way as it would with black and white film. I like to get as much right in camera as I can and not rely on heavy post processing. Having to think about what I want the finished result to look like before pressing the shutter, is I believe a healthy discipline and will improve your photography. I am pleased with the final result. The lighting on the cathedral and gardens could not have been better. The 28mm is only moderately wide so does not distort the view. The use of the orange filter provided more detail and interest in the sky which is an important part of the overall composition. I cropped the image from the native 3 x 2, to 5 x 4. I prefer this aspect ratio, it is more balanced to me. Its an image that I will almost certainly print, maybe quite large but that’s for another day. Thanks for looking and I hope you enjoy this photograph as much as I enjoyed making it. Do click on the picture for a larger view. Magnificent image, Alan. Beautiful tonality, light and composition. Thanks very much Simon. Kind of you to comment. Thanks James. I am looking forward to seeing more of your work from The Peak District.